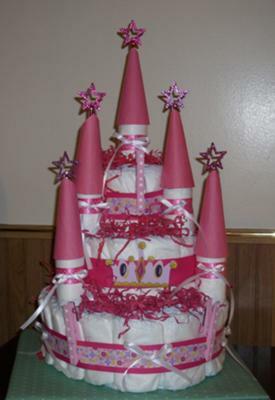 This is a five tier cake made with 64 pampers Swaddlers, the center is a wrapping paper roll. I used four soft blankets, with curly ribbon holding each in place. I made 6 or 3 pairs of rosebud socks with washcloths. Little hair bows are located on the second tier, along with two infant hats, bottle brush, lotion, oil baby powder etc, bib etc. I rolled all the diapers and tied them with curling ribbon. Stacked them accordingly and tied the outside of each bundle with curling ribbon. Stacked each "layer" and secured them with double sided tape. I wrapped the beautiful rose ribbon around each layer and made the bow for the front of the top layer. The top layer diapers are wrapped around a baby bottle filled with white M&M's. The washcloths, bibs, toys, etc. are all twisted with floral wire and then stuck in the folds of the diaper to hold them in. Various rattle picks are tied with curling ribbon and also stuck in the folds. The bear's arms are secured around the bottle with ribbon that is hidden by the binky clip. And, the hat on top of the bear is an infant hat that can be removed and used. All layers are placed on a decorative cake board and secured with double sided tape. I used tape instead of glue because I wanted my friend to be able to use the diapers if they wanted. Attach the boa to the cardboard circle using glue. Then glue the outer ring of diapers, filling in the middle of the circle with diapers until full. Next, cinch the bottom row of diapers with ribbon. Continue with the next two levels. Finish by inserting the princess wand in the center of the cake and placing flowers and curly ribbon on the cake. 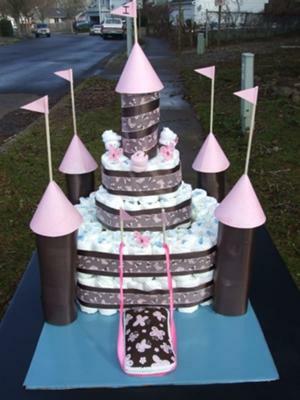 I made this castle diaper cake for my friend at work. She was having a girl and was using brown and pink. I rolled all the diapers for this one. I used a box for the shape and put goodies in it that I didn't want on the outside of the cake. It was in 2 layers for easy transport. I used bottles as a core for the towers. Scrapbook paper for the tops of the towers and flags. I painted the cardboard to look like a moat. The drawbridge is a wipes container I had made. It was a joy to make and took me many, many hours. I would do it again in a heartbeat. Hope this helps anyone looking for a princess theme. This Castle is made out of 45 diapers size 2, 10 items hidden with the castle (2 spoons, 2 washcloths, pair of socks, burp cloth, infant hat, teether). Attached are 3 fridge magnets. Paper cones for towers and star wands. Lots of ribbon & icing for decoration. Rolled each diaper individually tied with white yarn, started out by standing diapers next to each other in circle tied together with white yarn, add more diapers until reached size that I wanted. Did this for each layer. Once each layer was made wrapped with wide pink ribbon, and hot glued so would stay together. Once all ribbon was added taped the Princess wall decorations to the ribbon. Made little bows out of white and pink ribbon and hot glued miscellaneously around the cake. For a finishing touch add the baby's first and middle name on the ribbon with stickers.